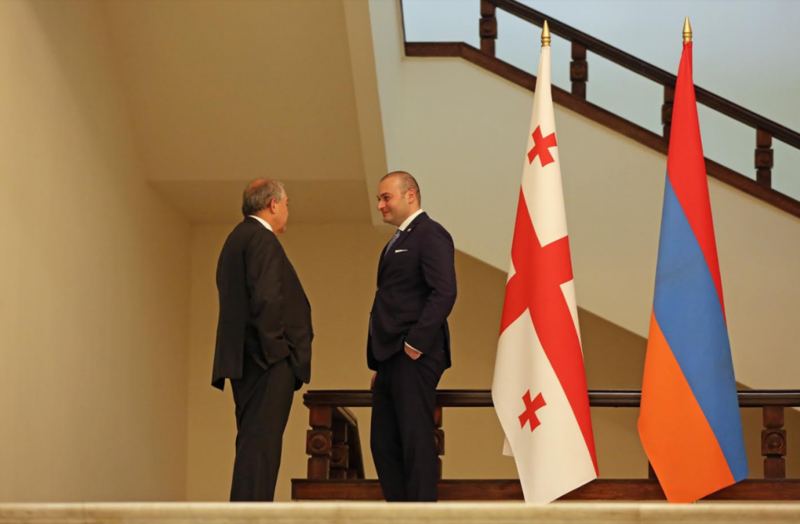 Georgian Prime Minister Mamuka Bakhtadze, during his official visit to the Republic of Armenia, held a meeting with President Armen Sarkissian. The parties discussed the two countries’ friendly relations and cooperation across a variety of areas. Special emphasis was placed on the potential for developing trade and economic ties. According to the parties, the planning of concrete steps in this direction will be fostered by the Intergovernmental Economic Commission which plans to hold its next meeting before the end of this year. The President of the Republic of Armenia hopes that the official visit by the Prime Minister of Georgia will give fresh impetus to the development of relations between the two countries. During the meeting, educational and cultural cooperation was also underscored. As Mamuka Bakhtadze pointed out, both Georgia and Armenia are celebrating the important date of the 100th anniversary of the independent republic. The Head of Government congratulated President Sarkissian on the upcoming Independence Day of Armenia celebrated on September 21. The larger format negotiations at the Residence of the President of Armenia were attended by Georgia’s Foreign Minister Davit Zalkaliani, Minister of Environmental Protection and Agriculture Levan Davitashvili, Deputy Speaker of the Parliament Giorgi Volski, and Georgian Railway’s CEO Davit Peradze.